Our very brief stay in London was to be over in a flash and we were off to Iceland. I’ve been dying to get to Iceland for years, and the kids were beyond excited about 9 days in a motor home. The adults were slightly less excited about the concept of 9 days in a very small space with them! 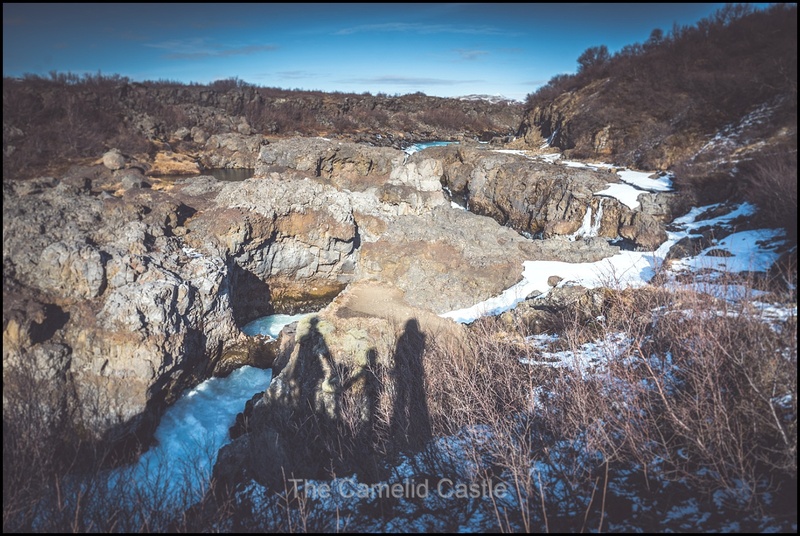 Luckily the scenery and adventure of Iceland made up for the lack of space and creature comforts……. 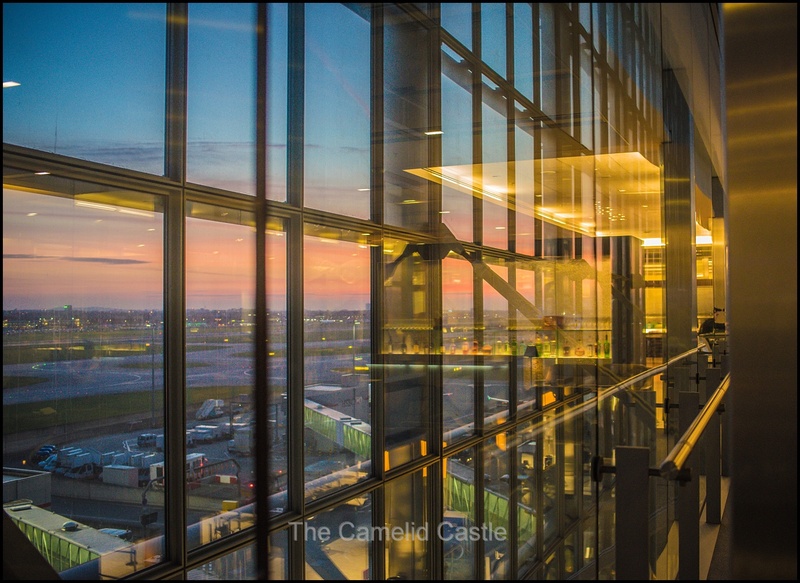 After our rather comfortable sleep in the Novotel Heathrow, we had an unfortuante 5am alarm set as our flight was 7.40am out of T5 at Heathrow. 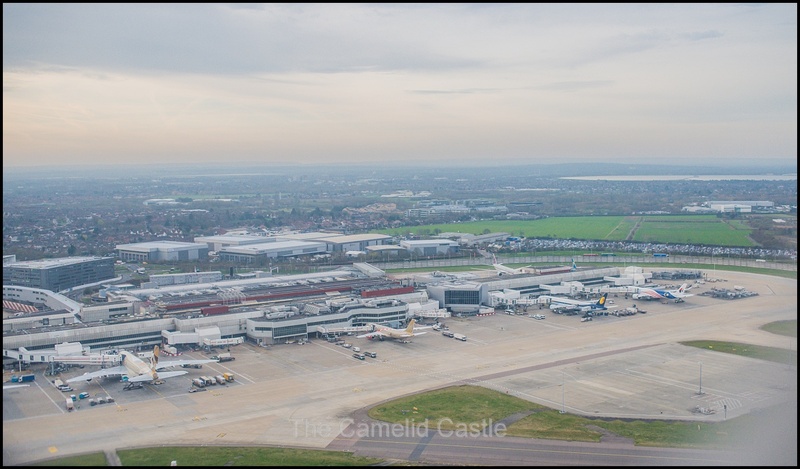 Despite the name implying it was close to the airport, the hotel is the other side of the runways and it was not walking distance to T5. The kids resisted getting up at such a ridiculous hour but luckily we didn’t need to really pack much after only a few hours at the hotel, so we quickly dressed threw on coats as it was 6 degrees and outside. We had a short walk across some busy roads in the dark, but pretty soon the free bus to the airport arrived. It was a public bus and packed full (despite being not long after 5am) mostly with people working at the airport, and a few other fellow travellers. 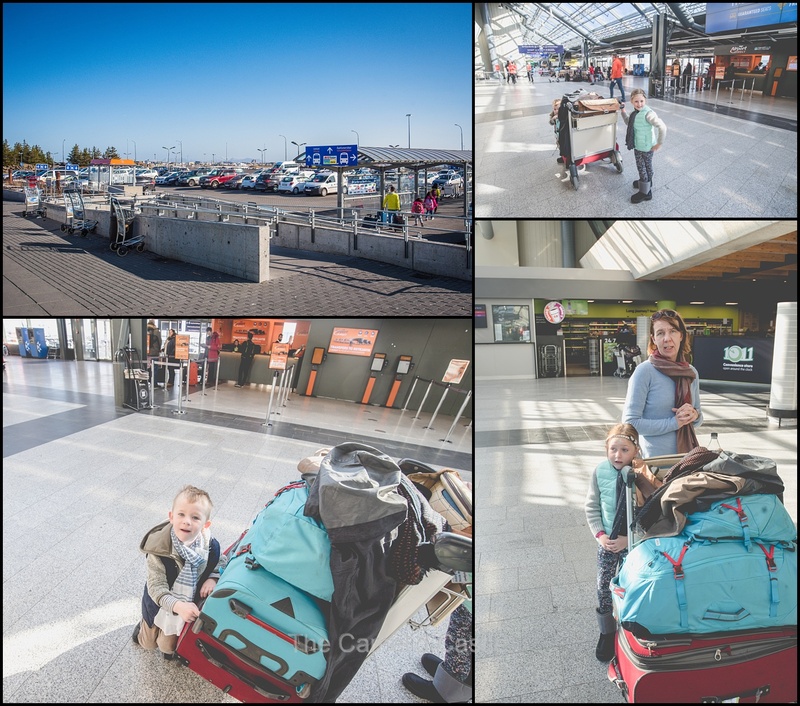 As our luggage was checked through to Iceland from Paris (we were technically still ‘in transit’) it was a relatively quick trip through security and off to the nearest British Airways lounge. The sun was just coming up over London and the lounge was quite busy being a Friday morning. Sadly the food in the lounge was not French standard but the pastries weren’t too bad. On the other hand the weird bread with egg and sauce and cheese was not something we cared for. We had a strange breakfast of chips, biscuits, porridge and pastries and our time zone confused bodies (London is an hour different to Paris) as we decided calories were best before hitting Iceland. The kids were still not convinced on being awake, Anto and I were just pleased to get some coffee on board – until we tasted it and realised it was bordering on undrinkable! We were boarding our flight to Iceland at a remote gate, and having being caught out by this on our last trip through Heathrow we left in plenty of time to get the train over, and another long bus ride out to the plane. We were in business class again (the continuation of our flight from the previous day that we’d booked on frequent flyer points). Despite being a bigger plane than the previous day we still didn’t have TV even on a longer (3 hour) flight and in business! Luckily we had somewhat anticipated this and the kids had activity books and the tablet to keep them amused. Pretty soon we were up in the air and we had lovely views over London. We took off towards the city and followed the Thames for a little while. It was one of the more scenic London departures I’ve had, it paled in comparison to the views of Iceland that were to come! Pretty soon it was time for a fairly tasty hot breakfast. British Airways have long since stopped handing out free food to economy so we were not sorry we were in Business for this leg. The food was definitely better than what we’d had in the lounge, and nicely filled in some of the flight time. The kids amused themselves watching shows on the tablet and Astrid did word puzzles and read. 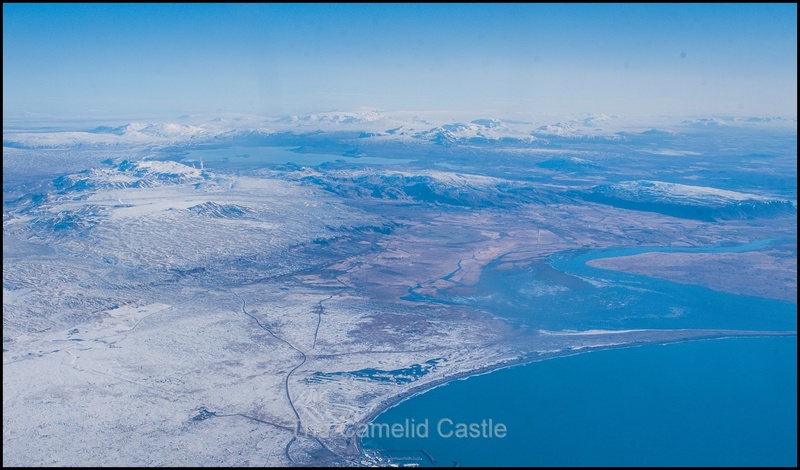 As we got closer to Iceland I turfed her out of the window seat as I was hoping for some nice scenery, and I was not disappointed. We’d flown out of the UK and past Scotland via the Isle of Skye (where we were to return later in the trip). 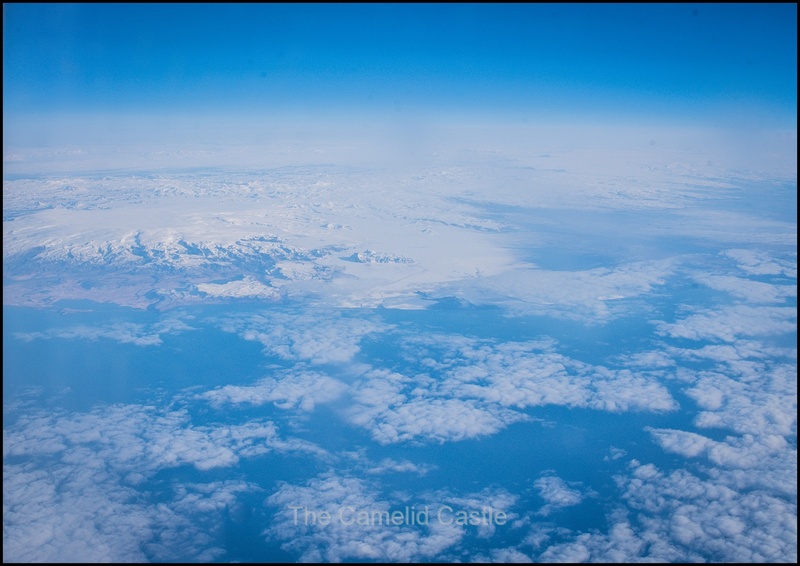 As we approached Iceland from its East coast there was a spectacular mountain sticking out of the cloud, which I heard the Icelander in the row behind me telling other passengers was the tallest mountain in Iceland. 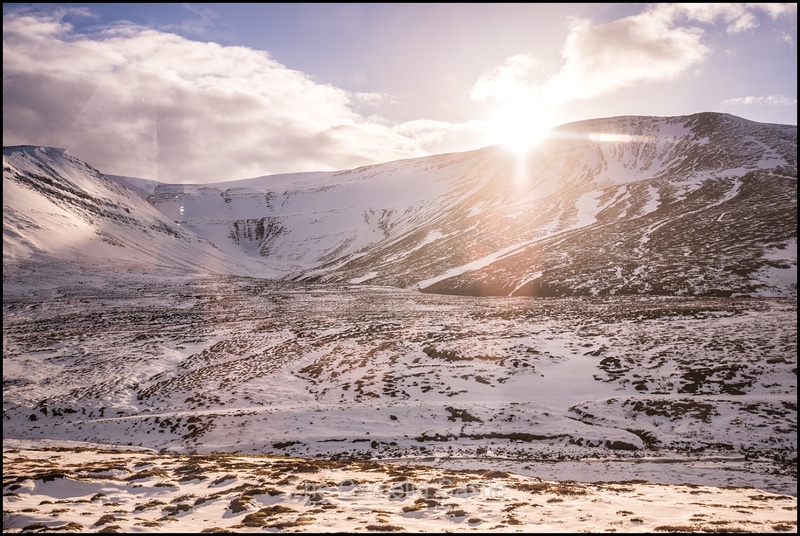 Despite being mid-Spring in most of Europe and the UK, it was still technically Winter in Iceland and the kids needn’t have worried about there being any lack of snow…….. there was snow stretched out below for the entire length of the country and it was breathtaking. Reykjavik, the capital city of Iceland is on the West Coast. The airport is situated in Keflavik, a town about 50km from Reykjavik, this meant we flew across the majority of Iceland in our approach, from the East coast to the West. The entire centre of the country is mostly uninhabited, and largely inaccessible for much of the year (other than in specialised vehicles). As we flew over we could definitely see why! People all over the plane were glued to their windows and commenting on the scenery. The flight made us all even more excited about what we were about to experience during our time in Iceland. We landed about 20 minutes early, despite Keflavik being the main airport servicing the country it isn’t all that busy in comparison to the average European airport. Being up the front of the plane we were off quickly and through immigration without any fuss. We all breathed a sigh of relief when our bags turned up so we had coats and didn’t have to delay plans for our departure from Reykjavi. It wouldn’t have been a convenient time to have luggage go missing or get delayed. The apparent temperature was minus 4 outside so not hot. Paris hadn’t been all that warm, but ‘Spring’ in Iceland is like the depths of Winter in our native Canberra. Due to the flight being early and our efficient run through immigration and baggage claim, we had a 40 minute wait for Þorgils (Thorgils), our motor home provider. Hire car, motorhome or camper van is pretty much the only way to see Iceland if you want to go much beyond the area surrounding Reykjavik. It is possible to do bus tours, but with young kids this was an expensive and highly unappealing option. 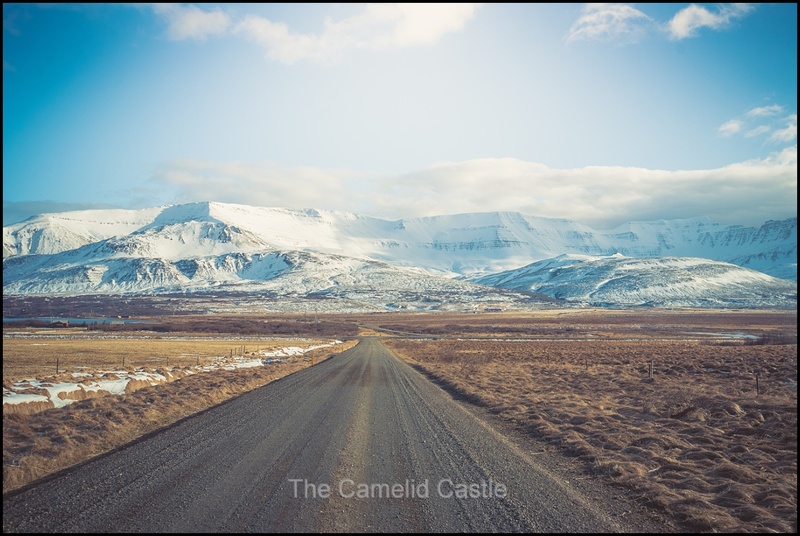 We were originally thinking of hiring a car but with the cost of hotels in Iceland, in addition to the car, it was far more economical (and much more flexible) to go with a camper or motor home. We quickly ruled out a camper as the lack of bathroom facilities with young kids was a worry (this turned out to be a wise decision given how difficult it was to find toilets during the Winter season). So a motor home it was! 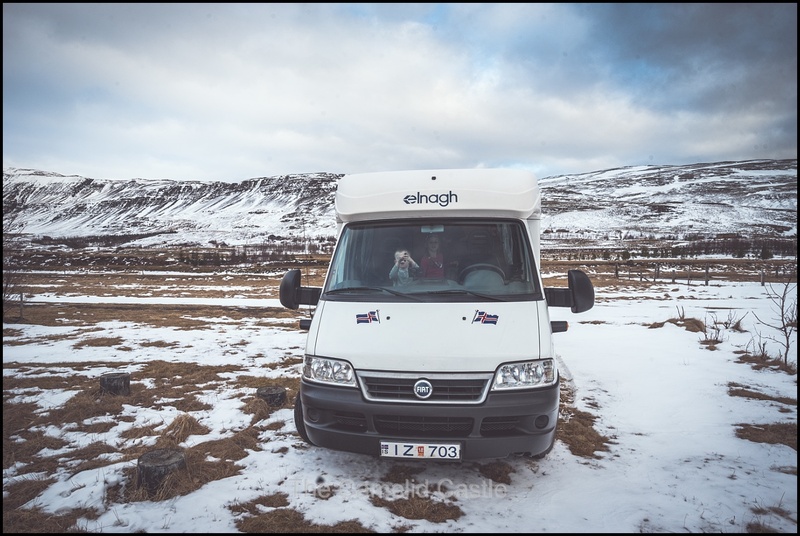 There are a host of motor home hire companies in Iceland. Tourism has exploded since the 2010 eruptions of Eyjafjallajökull and the options for motor homes were vast. So long as you were going to visit in the tourist season (Summer), which is June and July. We were having serious trouble finding anything available for our April trip. Campers yes, motor homes no. Luckily we found a private rental of a suitable motor home on Airbnb and it was an acceptable price. Acceptable meaning good for Iceland, but just don’t think about the 5 star luxury hotel it could buy you elsewhere in the world! Hiring the motor home through Þorgils turned out to be fantastic, it was much better set up than most of the hire companies and he organised pick-up and drop-off for us, plus gave us a host of useful information. Soon he arrived and we threw all our bags into the bed area of the motor home, put the kids (purchased in Paris) car seats in, and were off for the 40 minute drive to his house in a town just outside of Reykjavik. It was a beautiful and sunny but cold day. Luckily now we had coats the kids were happy to play outside (and intermittently drive us mad) while we spent 2 hours unpacking our bags into the motor home cupboards and dumping things we didn’t want for the next 9 days in Þorgils garage (as he’d kindly offered to store things for us). Given the limited space and we had and 4 people, plus car seats, some creative storage and games of packing tetris was required. Þorgils then painstakingly took us through how everything worked in the motor home. Apparently we were the earliest rental in the year he’d ever had and he was a little worried about how we’d go with camp sites and water, being off-season. We’d also been worried about the campsite situation, even the early opening ones tended to open in early May. Anto had spent countless hours locating and mapping out ‘open all year campsites’ and we’d tried to plan our itinerary around these as best as possible. 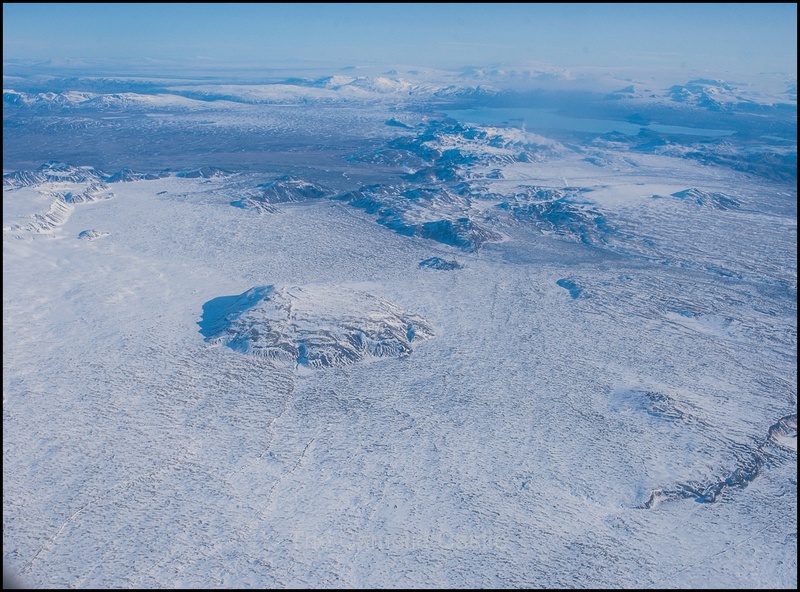 We hadn’t been so worried about the water situation as our research had indicated that water was freely available everywhere in Iceland (the place is covered in ice and snow that is fresh and drinkable for most of the year). Water was ‘supposed’ to be available at every campsite and all petrol stations. At this stage the kids were getting over playing and we were all getting anxious to get on the road, we had a lot of ground to cover before the day was over. Even with the time change back an hour from London it was now after 1.30pm. Still Þorgils was insisting on us carrying extra water with us and was carefully filling crates full of coke bottles with water from his garden hose. We were getting a little impatient but it turned out that he was right and carrying that water was a very smart move and was time well spent. We had wisely ditched the BBQ gear from under the motor home into his garage and replaced it with the crates of water. Finally, with water on board, Þorgils wanted to go and replace a few kitchen items that he’d only just realised were broken, so he had us follow him in the motor home to the nearest ‘Bonus’ supermarket so we could stock up on food while he headed to the adjacent IKEA. We had an entire bag of food we’d carried from France but we needed a few more bits and pieces and some fresh items. It was now well after 2.30pm (4.30pm French time) and we were all hungry so we had our first meal cooked in the motor home, toasted cheese and tomato sandwiches, eaten in the Bonus supermarket car park. It was one of the least scenic of our lunch stops during the trip but definitely not the last time we cooked toasted cheese and tomato sandwiches! While we were cooking and eating we worked out plan of attack for the afternoon. 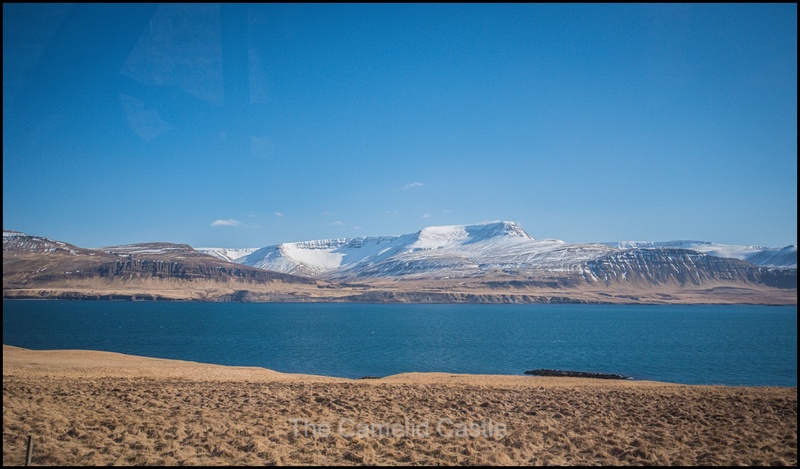 When planning our trip, Anto and I had spent a very long time on a detailed itinerary for Iceland. We planned to drive the famous route 1 ‘ring road’ that circumnavigates the country. You can’t go through the centre, especially in a motor home and most definitely not in April, so once you commit to the ring road you have to keep going or double back. The big decision is always whether to drive clockwise or anticlockwise. 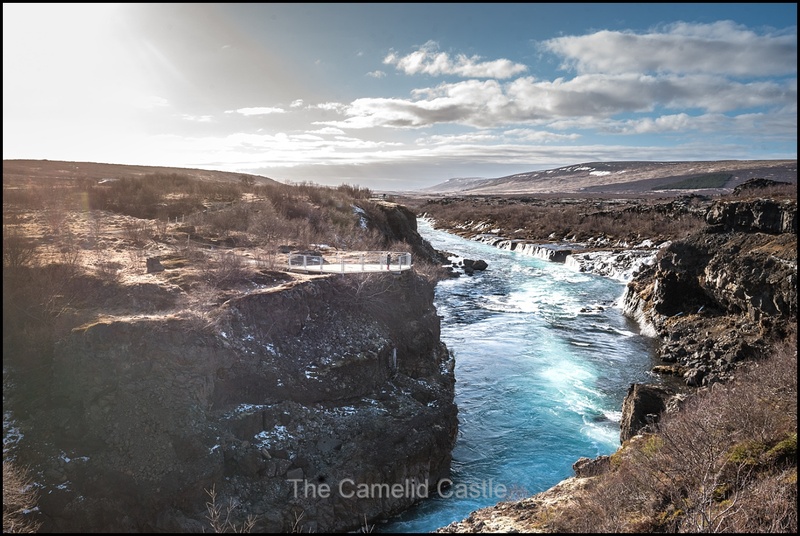 Most people go anti-clockwise, visiting the famous ‘Golden Circle’ attractions near Reykjavik first and then heading to the South Coast. Both directions had pros and cons and we had planned our itinerary so we could reverse it and go either way but thought that clockwise suited us best. We had read quite a bit of advice before departing (which was reinforced by Þorgils) that the direction was best picked based on the weather forecast. Wind is a massive issue in Iceland, the winds get up and you are literally stuck, often for days. With no short cut options through the middle of the country you need to plan around wind forecasts and try to stay ahead of high winds. While eating we scoured the official weather sites and everything looked good for the next few days and the predictions seemed to work best for our plan of heading clockwise, so clockwise it was. Lunch onboard and travel direction decided, Anto bravely drove off in our motor home, released into the wild by Þorgils. Reykjavik traffic and endless circles were terrifying in a heavy vehicle while driving on the wrong side of the road and it was a bit nerve-wracking until we all settled in. Pretty soon we were out of Reykjavik and into the beautiful countryside of Iceland. Leaving Reykjavik we were heading North then West. 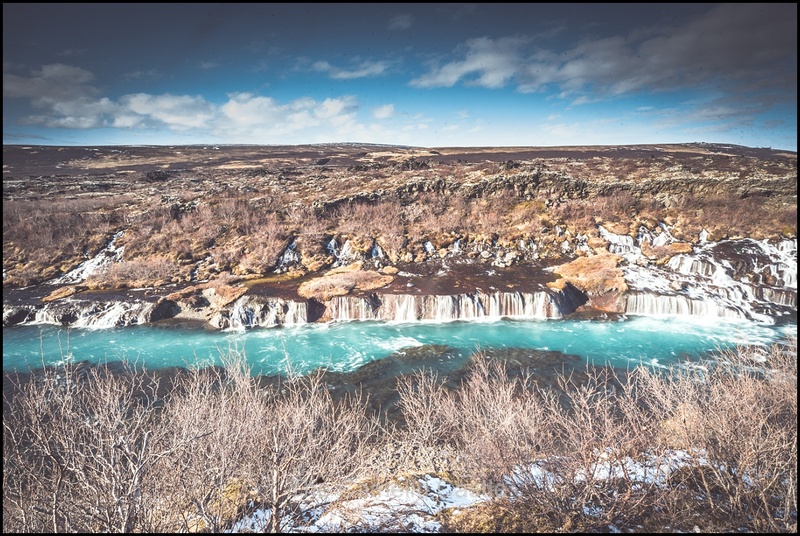 Iceland has a total population of under 350,000 (less than our home of Canberra which has over 400,000) and has an area of 103,000 square kilometres, making it the most sparsely populated country in Europe. Of the total Iceland population, around 220,000 people live in the Reykjavik area, so once you depart Reykjavik it starts to feel like you are in the middle of nowhere pretty fast! 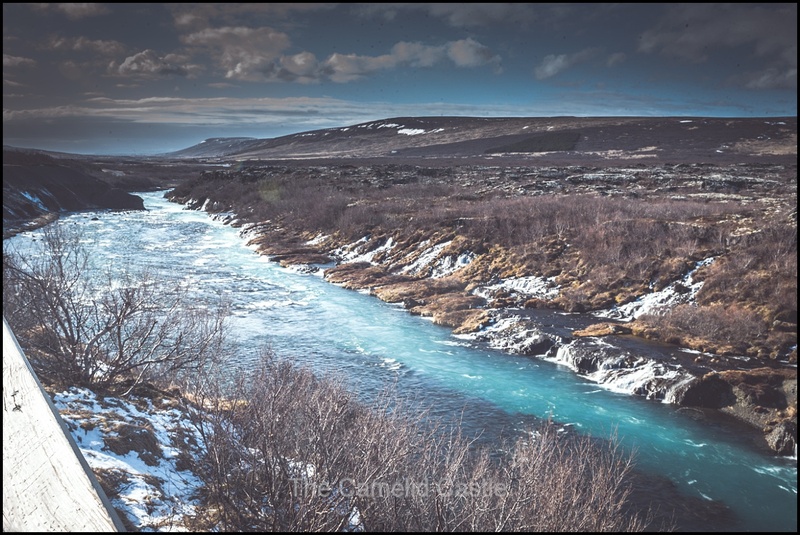 Our first planned stop at Hraunfossar waterfalls was a 128km of driving. 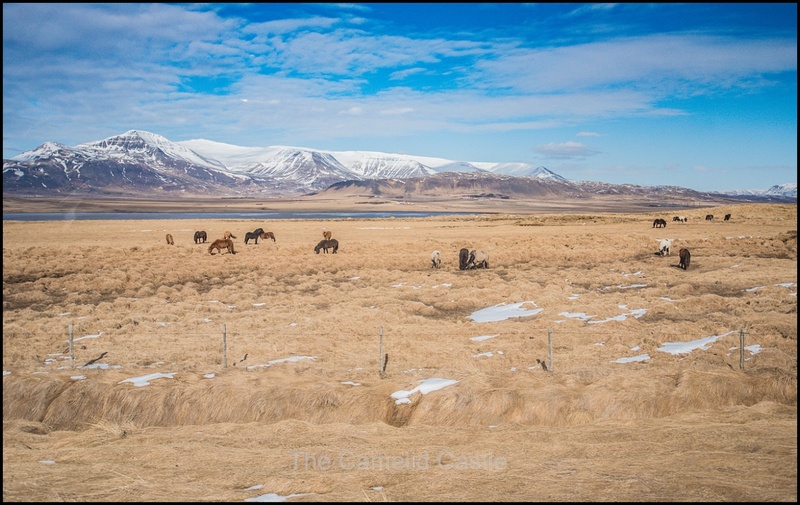 The landscape kept us enthralled with snow-capped mountains, blue skies and Icelandic horses and geese lining the road. The kids were rather tired after a very early start and despite being excited to be in the motor home and spotting Icelandic horses they were both asleep pretty quickly. It took us around 1.5 hours to reach Borgarfjordurs in West Iceland, the location of both the Hraunfossar waterfalls (the ‘lava falls’) and Barnafoss, known as the children’s waterfall. We parked the motor home and the kids were awake and ready for an explore. 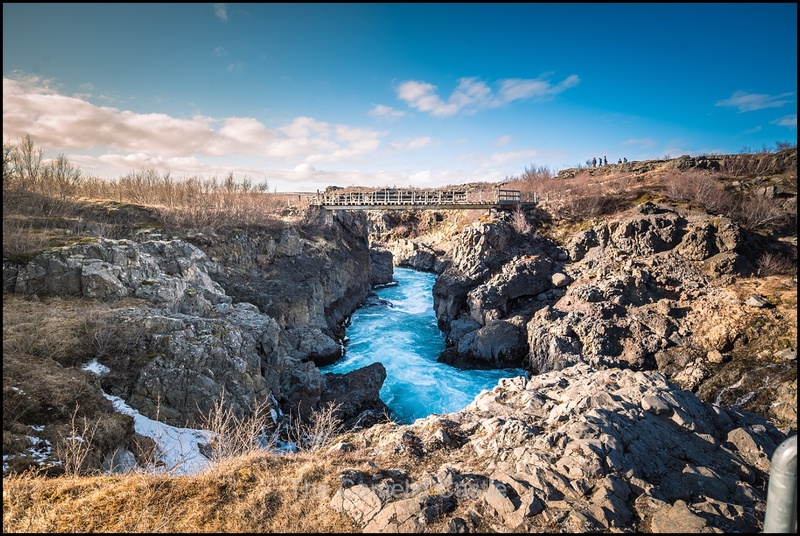 Hraunfossar is a collection of small creeks and cascades streaming from the lava flows along a stretch of around 900m. As we learnt in our Iceland research (and then in practice during the trip) there are no shortage of amazing waterfalls in Iceland. This one is fairly unique though and definitely worth a visit. The glacier Langjökull is visible behind the falls and the lava field is a construction from one of the volcanoes lying under the glacier. 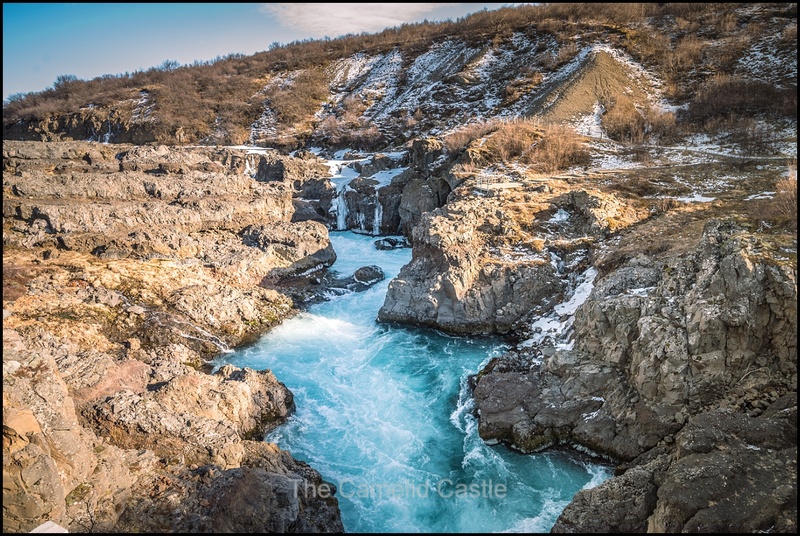 The water is the most stunning turquoise colour from the glacial melt……. The falls were amazing. There were multiple viewing platforms and a small amount of walking over bridges but the Icelandic are not fans of making things tourist-proof so there were plenty of sections that were mildly terrifying with the kids, luckily they are well-trained to hold hands! After a walk along a section of Hraunfossar we headed on foot to the nearby Barnafoss (you do this on foot, there is a shared car park for both sets of falls). 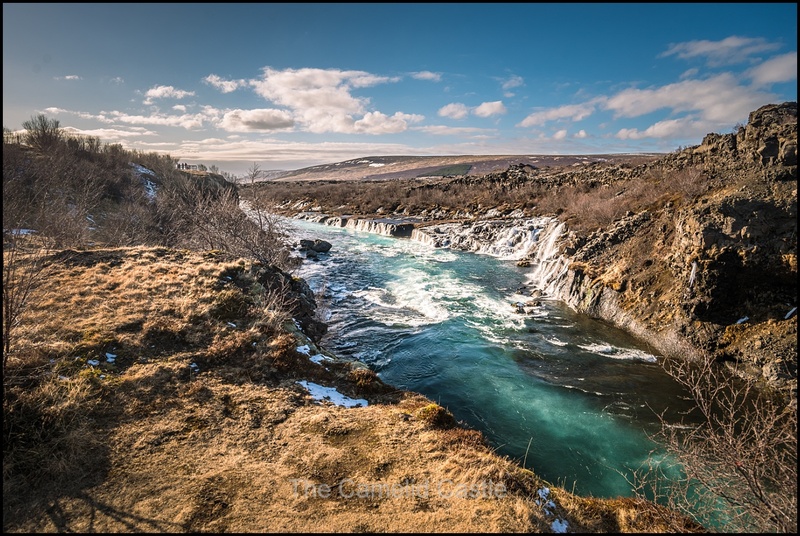 The Barnafoss ‘children’s falls’ are so named as there is a legend that 2 children of a widow were playing on a stone arch crossing the falls and fell and died and their mother had the arch destroyed to prevent further children dying. Iceland is full of such delightful stories! The Barnafoss falls are also impressive and the kids were rather fond of the large icicles throughout the falls. They were also keen to have a play in the snow. It was the first snow we’d seen on this trip up close, but plenty more was to come! 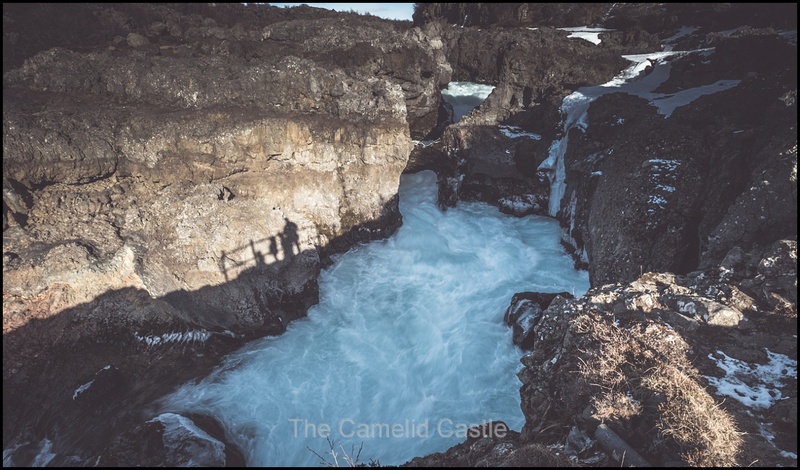 Much of the water in the falls and river was still frozen and it did not look inviting and again rather terrifying with small kids………. so we had a short explore, took plenty of pictures and declared ourselves well and truly frozen! It was back to the motor home for some warmth. We decided to skip thermal springs at Krauma (we had others to visit later in the trip) and the geothermal power station at Reykholt and head for our campsite as it was approaching 6pm. West Iceland had very limited options with regards to open campsites in April but we’d found a supposedly open one in Dragavegur, another 61km away and in the general direction of Borgarnes where we were headed the next morning. We set off with spectacular mountains and snow everywhere we looked, and all was going well until the road became less sealed and rather gravelly. Soon it descended into an array of large potholes, not fun in a heavy vehicle! Pretty soon the road was single lane and we were driving through sections of snow. The single lane road is rather common in Iceland once you get off Route 1. As you can see from the photos there aren’t many other cars, you could literally drive for hours and not see another vehicle, it could be off-putting at times! It looked like we were going up a very snowy mountain, there were no houses to be seen, and the road was getting worse but there was nowhere to pull off as the road was beside large cliffs of snow, much less turn around a motor home. Anto and I agreed we’d just keep going and hope our map and sat nav was right….. Eventually the road levelled out and we spotted the odd house and we reached the campsite at Dragavegur. It didn’t actually appear open (we later learnt that in Iceland ‘open’ can mean you are allowed to park there and can get in but there aren’t any people or services). There were other caravans around, mostly covered in snow but little signs of life. However we decided we weren’t going back through the snow and over that road tonight so we parked the motor home and went for an explore. Anto could see the power boxes but there was no one in the camp office to let us know how to use them or give us access to the water and showers, so just decided to use our van power for the night and conserve our water and skip showers. This was a pretty amazing first camping spot and we were warm and had food so figured all would be well. Anto whipped us up some pasta for dinner, which was a challenge in such a small space. As the week progressed we developed a routine for meal preparation and getting the kids ready for bed. The first night we had to relocate where we’d put everything that afternoon and figure out a protocol for dealing with the kids car seats and setting up the dining table and beds. One of the down sides of our motor home was that the kids bed was set up from the seating and dining area, but most night we initially put them to bed in our bed at the back so we could continue to watch TV and use our computers. Once we were ready for bed, we’d set their bed up and move them. Their car seats lived in the driver and passenger seats overnight. In the morning everything had to be reversed before we could even make breakfast, but we quickly established a routine for dealing with the logistics and tight spaces. The kids asleep we watched the sunset, feeling like we were both at the end of the earth and in the middle of nowhere. Luckily we had arranged internet for the motor home so could keep up to date and check our route for the next day with no trouble, despite not being anywhere near civilisation. The weather forecast predicted snow for the next day and we were not to be disappointed! 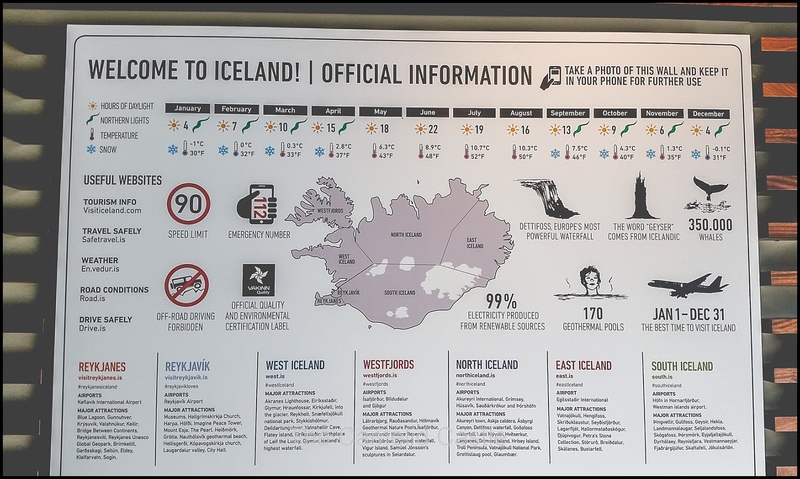 Daily statistics for Friday the 6th of April, 2018 in London, England and Reykjavik and West Iceland – we started the day in London at a brisk 5 degrees but when we landed in Reykjavik, Iceland it was only 4 degrees with an apparent temperature of minus 4. 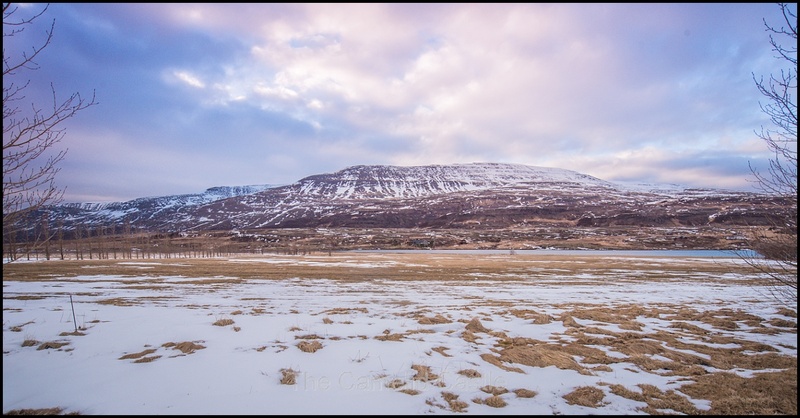 The temperature range for the afternoon as we headed to West Iceland was a maximum of 3 degrees with the temperature falling to minus 11 overnight! The total walking for the day was a paltry 5.6km, but we had spent most of the day on planes or driving. We did manage to get through over 230km of driving in the motor home, through snow and driving on the ‘wrong’ side of the road! Up next – our first full day of exploring Iceland and we were heading to the Snæfellsnes Peninsula. Snæfellsnes is known as ‘Little Iceland’ as it has a taste of many of the things you see as you circumnavigate Iceland, and it didn’t disappoint! Posted in 4 years, 6 years, Anto, Astrid, Barnafoss, England, Europe, Flights, flying business class, flying with kids, Heathrow, Hraunfossar, Iceland, Iceland in a motor home, Icelandic horse, Keflavik, kids, London, motor home, Reykjavik, Snow, Soren, Travel, travelling with kids, UK, waterfallBookmark the permalink. Hi Nic, just read your blog, perfect! Maybe you have contacts of Thorgil, as we planing Iceland trip and thinking to rent motorhome. Thank you! Thanks for your comment and reading about our Iceland adventures! We do have contact details for Thorgils, I will email you.